O.C. Sound is the Pro Audio company started by Bob Johns and myself in 2000. Over the past few years we have found the need for some form of wireless transmitter / receiver system for a remote speaker system. These are either outdoor events that required a second set of speakers a couple of hundred feet away from the mains or in a hotel conference hall that would have involved extensive cabling through congested areas. We had tried using a wireless in-ear monitor system but found that it was prone to dropouts and static interference, which was not an option for us as we pride ourselves in high quality sound. After some research we contacted Listen Technologies. We all know what they say about first impressions and I can tell you that the people at Listen really impressed. Very easy to talk to, great communication both form the sales people and the Technical support. I had some questions on the specific system we needed such as frequency choices, antenna type etc and the Listen staff went above and beyond in helping. 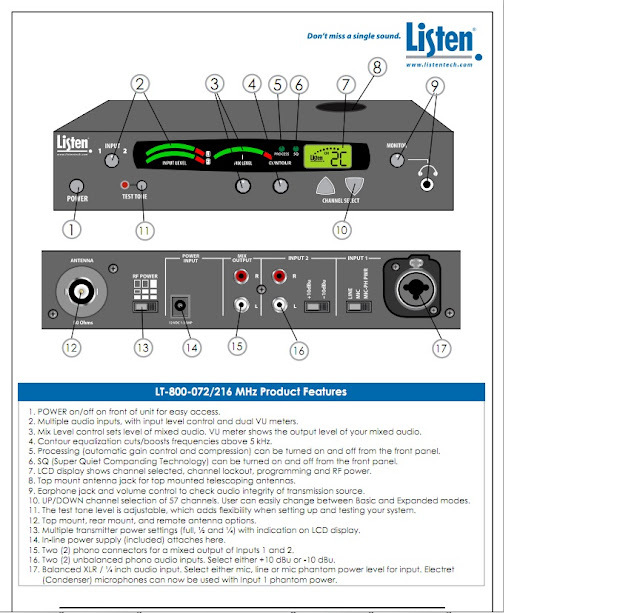 We finally decided on the LT-800 Transmitter with the LR-100 Receiver. There are two frequency options with this system 72Mhz and the 216 MHz each have 57 channels to choose from but the differences are in audio frequency response and range. For us the range and comfort of having a stronger signal was more important that the slight loss in the upper frequency range. Since most of the events we would be using this for would be predominantly speech with some music. Also from talking to the technical staff their opinion was that although the 216 system was rated to 10Khz you would have a hard time hearing any difference between the two. There is no difference price between the two. Once we settled on a system and placed the order, the units were shipped right away and arrived within a few days. Eager to test them out we took them to our church, Orangeville Baptist, which is made up of a 6000 sq ft gymnatorium and about 30,000 sq. ft total building area. The transmitter was set up in the main sound booth in the gym and we took the receiver to several areas in the building. The signal had to go through concrete block walls, poured concrete walls and floors with re-bar etc and there was no loss of signal anywhere in the building. So we jumped in the car plugged into a power inverter and went for a drive. Just over a kilometre down the road we started to get some static and lose signal. Considering the Transmitter was still inside the church building we were very impressed how far we got. Today September 11th was our first real test at an event. This is a yearly memorial service put on by a local funeral home, Dods & McNair and is attended by about 1500 people. Approximately 600 people are in the tent and the others are spread out in the grassed area around the tent. About 200 feet away from the tent they have an area set up to serve food. This is where we set up the remote speakers. During setup and testing we just used the standard Helical antenna and it worked perfectly. However just to be sure of having a strong signal we did use the Coaxial Dipole Antenna on the Transmitter and hung it from a pole mounted to side of the tent. The Sound quality was excellent, there was no interference or drop-outs. We did run the signal through a time delay to align the audio. This gave us full even coverage from the tent all the way to the remote speaker location. The LT-800 has lots of features and input options that make it an extremely flexible tool. Check out the details here. In summary the people at ListenTech are excellent, friendly, supportive and really know their products. Their Tech support is great and is very helpful is the decision making process as to what products you really need. The combination of the LT-800 and the LR-100 really is the solution we needed and performed flawlessly. The sound quality was excellent. If you in the market for a wireless system for audio distribution then I would highly recommend the Listen Tech products.